SEFFINISTO: Trend: FALL for it! Welcome Fall! 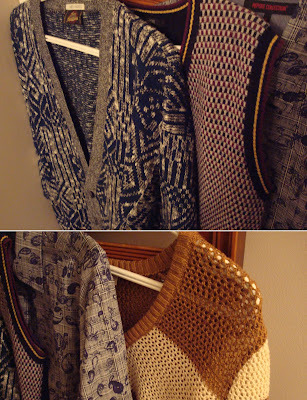 - the season of knits are back! It is the season of the year between summer and winter, lasting from September to December where you could feel the wind's breeze and see the changing color of the leaves. Knits are must have in the fall season. A a needle work created by interlacing yarn in a series of connected loops using straight eyeless needles or by machine. 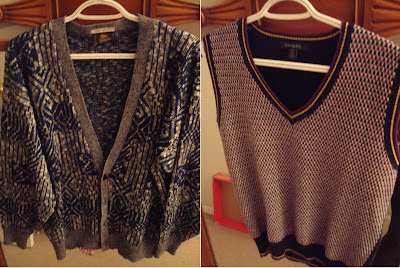 And of course, I have my very own set of knits that I got from various shops mostly in Vintage. These clothes are so comfortable to wear and it is very warm for such a chilly weather like what we have today. Both purple-like in color, the cardigan knitted sweater (from USED Vintage in Vancouver DT) and the knitted vest (Forever 21) are one of my favorites. They complement each other and it is very chic to wear. I find it playful too where I could match them up with a scarf, a polo shirt, or with a blazer. The one in the left is not a knit but it is woven perfectly and it is fit for the Fall season. It has purple petals' print and its unique style outshines other kinds of polo (from Report Collection in Tip Top Tailors Metrotown, B.C). 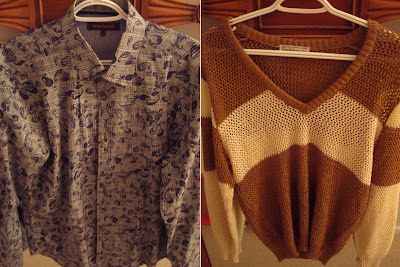 And the one in the left - the best knit I got is this earth-toned deep V-neck sweater which plays the colors of brown and khaki (from USED Vintage in Vancouver). I like how distinct the style is and its individuality as a knit sweater catches the attention of the people and it's really fun to style, pairing it up with a polo/polo shirt underneath to make it more interesting. Knits are very quirky, fancy, and playful in the eyes. You could style it fashionably with the right colors and clothing that matches with it. You just have to be innovative in every way, and you will stand out among the rest! Have fun shopping guys!